I've been sorting through the twins' clothes and realised that Nicholas is going to need a couple of sweatshirts shortly, when he finally outgrows the 3 month size ones I bought and made him rather a while ago! So I drafted this one for him. 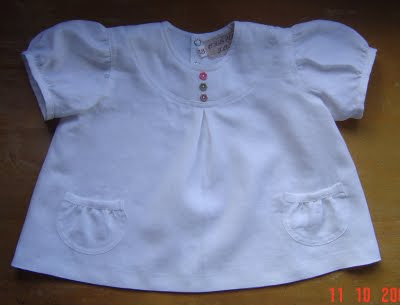 I love this neckline as it's so easy to get on, and you get two layers over the tummy, which is nice if it's cool. 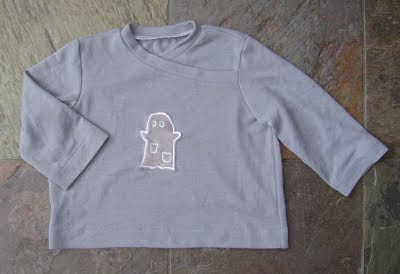 The cute ghost applique is from an Ottobre magazine so, much to Georgia's delight, this one is definitely not going to be sold. 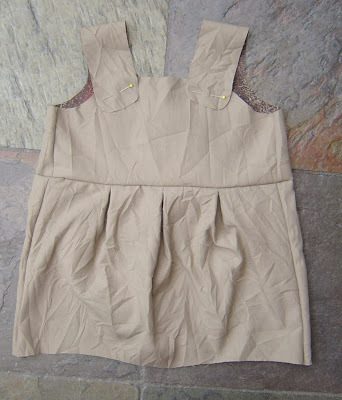 Then I drafted this pinafore. I was a bit iffy about the amount of room at the hem, so made a toile. It was supposed to fit Isabella, and it did, but there was no extra room, so I graded it up. And made another toile. I seldom make toiles because I can't be bothered, and I want to spend my precious sewing time on something that will be worn. 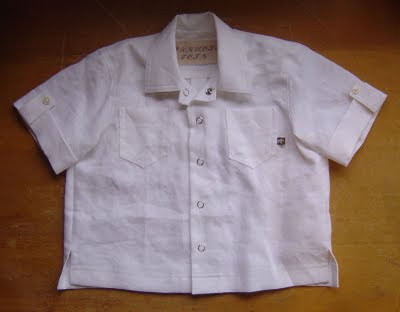 But I don't want to spend my precious sewing time on something that is unwearable, hence the toiles. I'm really glad I did, because now I'm confident that this will not only fit Isabella , but also that she can walk around in it (and therefore I can confidently call it an 18 month size and sell it). Which brings me to the best news - I went into Miracle yesterday, and to my utter delight, they are going to sell my designs! As I assumed they will take them on consignment, so I will be paid if and when anything sells. I am officially a childrenswear designer. Yippee! I get a bit irritated by the overuse of the term vintage - a three year old dress Is Not Vintage, in my opinion. I do however feel completely justified in my description of my latest creation as "vintage inspired". More accurately, it's a modern interpretation of a historic design. I own this book ("Costume in Detail, Women's dress from 1730-1930" by Nancy Bradfield) because about 20 years ago a friend found it in a 2nd hand bookshop and thought I'd like it. (This is the same friend who introduced me to the people at the Globe Theatre, where I volunteered for quite a few productions doing wardrobe. I was actually in charge for a few, and got my name mentioned in a review in the paper once! But I digress) Anyway, every now and then I browse through it's pages, and last week I found this page. This simple child's dress just called out to me and I had to make a version of it. It wasn't too hard to draft but I had to allow for making the neckline much less wide than the original, so in order to preserve the proportions of the back sections I gave the sleeves a centre seam so that they don't have to meet at the shoulder, . The front is very simple. 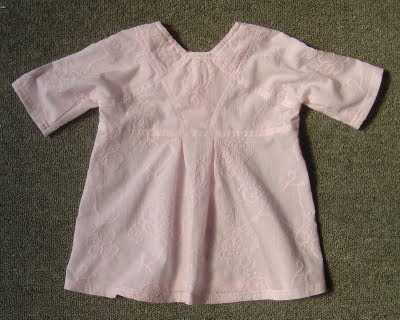 The fabric is a pretty embroidered cotton voile, which was perfect for the design. Hidden domes again. Everything interesting happens at the back. I just loved the seaming detail! Obviously this has to be worn over something, so I think I'll make a basic slip dress to go under it. I wish I had a wedding to take Isabella to! For his guitar. I have nothing interesting to say, but I've been dying to use that title! I know I know, small things and small minds. I just thought it was funny. We've had a couple of really careful conversations about his need for a new guitar string in which each of us tries not to suggest that he needs a g-string! Still haven't managed to get to my new design. Who'd have thought life with baby twins would be so busy? My aunt sent me 40 pounds for my birthday. When converted (and the bank took their fee, grr) that came to just over NZ$77. The dilemma - what to spend it on? Naturally it had to be something special. I thought about putting it towards a handbag or shoes, and then got on to sewing stuff. What did I want, but couldn't justify buying? 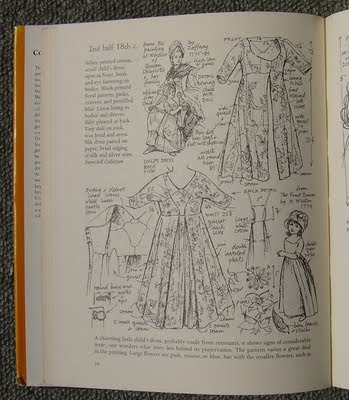 Almost immediately I thought of the Winifred Aldrich childrenswear pattern drafting book. I knew there was a later edition than the one I borrowed from the library, and this one covered baby wear too. Perfect! About 5 mins on the net showed that Amazon had it, but even better the University bookshop had an even later edition, and Keely is a student and eligible for a student discount! So I gave her the money to get or order the book next time she was near the bookshop. 41minutes later I got a text to say that she'd got it! I had to wait till after I'd been to the gym to pick it up, and then till we'd put the twins to bed before I could read it, but then I got to study it. And I am so impressed. There is a lot of stuff in here that would have been very helpful in my efforts to date. Best of all is the stuff on babywear. I was reluctant to grade my blocks down much further since they were already modified from instructions for bigger drafts. The book does have a couple of very minor errors that I've come across so far, but they were very easily dealt with. I am very keen to see how this block compares to the drafts I've already done. I really really like drafting. I enjoy the process of creating patterns nearly as much as making the garments! Meanwhile, here's the latest of my designs, made over the weekend. This one's a size two. Georgia thinks that they're too cute for selling, and should be kept for Isabella. 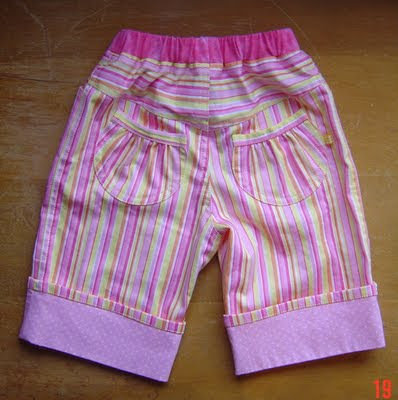 But then she thinks that about everything, and seems to forget that I made the pattern as well as the capris and can grade it to fit Isabella! Today is my birthday. I'm 40. In the lead up to this momentous occasion people keep asking what I'm going to do to mark the milestone. I kept feeling like I should do something big, since it's a Big Birthday, but the truth is I'm sort of over birthdays for myself (there are enough birthdays in our house to get excited about - kids birthdays are way more fun!). I have no issue with turning 40. I've been alive for 40 years, I have 40 years life experience and the body to prove it! I did want to be back in shape after the twins, and I acheived that with time to spare - 12kg lost and several months of the gym have me looking how I want. I don't look 18, and neither do I want to. I want to look like a fit 40 year old. So another birthday just didn't seem to be worth getting excited about. However, with school age kids, all birthdays require special teas and birthday cake. I agonized for ages when I realised that my birthday is a Wednesday - my gym day. When I go to the gym I feed the family and take off, having my tea after I get home and we put the twins to bed. I worried that Georgia and Oliver would feel totally ripped off without a birthday tea, and then figured, it's my birthday, I get to do what I want, and I want to go to the gym as usual! Georgia will make me a chocolate cake this afternoon and ice it while I'm out. We'll eat it (and I'm sure they'll sing me Happy Birthday) when I get home. Everyone is satisfied. And then I got up this morning, ready for a pleasant but not overly special day. And my darling children presented me with the cards they have been working on for DAYS. Georgia bugged David to take her to the Warehouse for some craft supplies and made a very cool card, and taught Oliver how to do one too. They spent a lot of time on them, and it really reminded me what IS special about birthdays. My children got as much pleasure making those cards with much love and care as I got in receiving them. And here they are. After that excellent start to the day my Mum arrived so we could go to Glenfalloch (a beautiful public garden on the peninsula). She came in carrying a large oblong box, which completely mysitfied me. I couldn't imagine what it was till I unwrapped it. My mother is the QUEEN of present buying. For Big Birthdays she rounds up all the family to contribute and get something big. For me: a six line, 6.5m retractable washing line. (AND a post to mount it on, AND a bag of concrete mix!) Ever since we bought this house we have been meaning to do something about the inadequate washing line (2 lines, upped to 3) and my brilliant mother figured this was an ideal present. She was so right! I did wonder what it says about me that I got ridiculously excited about a washing line for my birthday. (I think it says that I am practical minded and not overly sentimental.) We then went for a very nice morning tea at Glenfalloch. I have to say, the staff at the tea rooms there were brilliant - they weren't open yet, but the extremely obliging lady from the bigger venue couldn't have been nicer about bringing down hot water for our coffees (since they weren't ready yet) and letting us in to have our morning tea there (despite the fact that there was a bus due any minute which was going to make them very busy). Very very good service. So, I think I've decided that birthdays ARE worth getting excited about. Because now we are looking at having to buy a new computer. He is careful, and has cleaned out the inside of the computer many times before, but this time it died and refuses to go at all. Probably not directly his fault, but still! Since our laptop was away at the time this meant No Computer for two weeks. The two weeks of the school holidays. When it rained. A lot. Oh yes, fun times in our house lately! Anyway, laptop returned, we are at least back in the 21st century. At least with no internet to waste time on I did do a bit of sewing. This is the latest crop of my own designs. 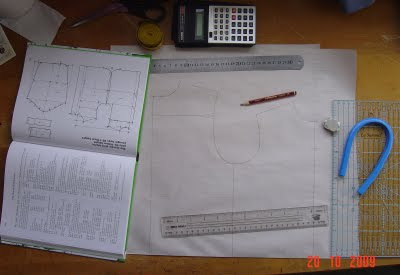 This is a tunic I drafted and cut out several weeks ago, but felt a bit ambivalent about, so left sitting. I dragged it out when I couldn't be bothered dreaming up a new project and sewed it. And what do you know, I ended up liking it! 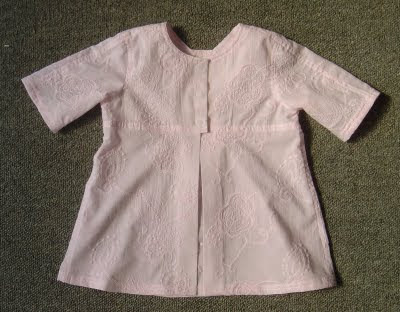 The back has the same concealed domes I used on the two pink shirts a little while back. 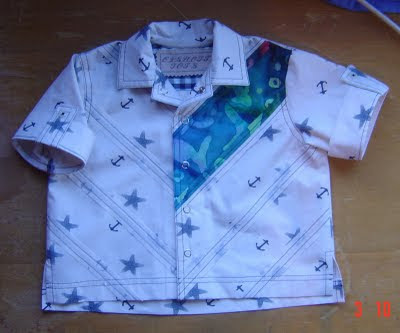 This shirt is the same basic pattern as earlier ones with the front pattern piece slashed on a 45 degree angle to create panels. I made one from a contrasting fabric just to jazz it up even further. After I'd spent a considerable amount of time creating the pattern pieces, cutting out and assembling the shirt I realised that I could acheive a very similar result by simply sewing bias strips to the front to create stripes. Just to really top it off I realised that I'd already had that idea and sketched it weeks ago! I should go over my sketches more often. This one is from some beautifully soft linen I found while cleaning up. Obviously my reward for procrastinating since I was cleaning up the fabrilanche (the overflowing pile of unsorted fabric next to my desk, christened the fabrilanche by my very amused husband some years ago) instead of some boring housework I'm sure I should have been doing instead. 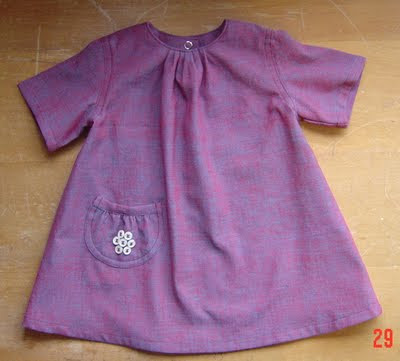 And finally a tunic from the same linen. It's very wide thanks to the central inverted pleat and even though it's from the 80cm height block, which corresponds roughly to an 18 month size, I wonder if it should have been a size 2. 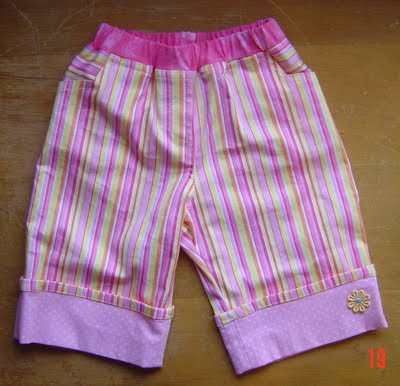 I think it'd be too short on a 2 year old, and on a hot day loose swingy tops are so comfy to play in. The buttons came from a packet I got at Spotlight when I had to go back to get the sewing machine needles I'd bought and found missing from my bag when I got home. My reward for having to go back I think! So that's what I've been up to. I went and visited my very clever and creative friend J last week to make some care label/swing tags. When I sew for her she sits next to me and says "Uh-huh, yes, right, I thought so" at appropriate moments. When I visited her to do the labels it was my turn. She is a whizz on the computer and a scrapbooker, so she has a very good eye for that sort of thing. Yay for J! So I now have the labels I needed to be able to sell my designs. The girls are coming over tomorrow, so I think I'll pick their brains regarding what they're worth, and then I can take them in and see what happens next. Now I'm nervous again - what if no one likes them? Self confidence has never been my strong suit.